Backing Up MySQL on Consistent State - Knowledgebase - SeFlow s.n.c. Download and unpack scripts that should be executed before and after snapshot creation. The scripts lock tables with“FLUSH TABLES WITH READ LOCK;” command and unlock them after Acronis software takes the snapshot. Place config.sh to the working directory of the scripts. when backing up a VMware virtual machine at hypervisor level (agent-less backup), place the scripts on a VMware virtual machine to specific directories listed in this article. The scripts will be executed inside the VM upon quiesced snapshot creation automatically. 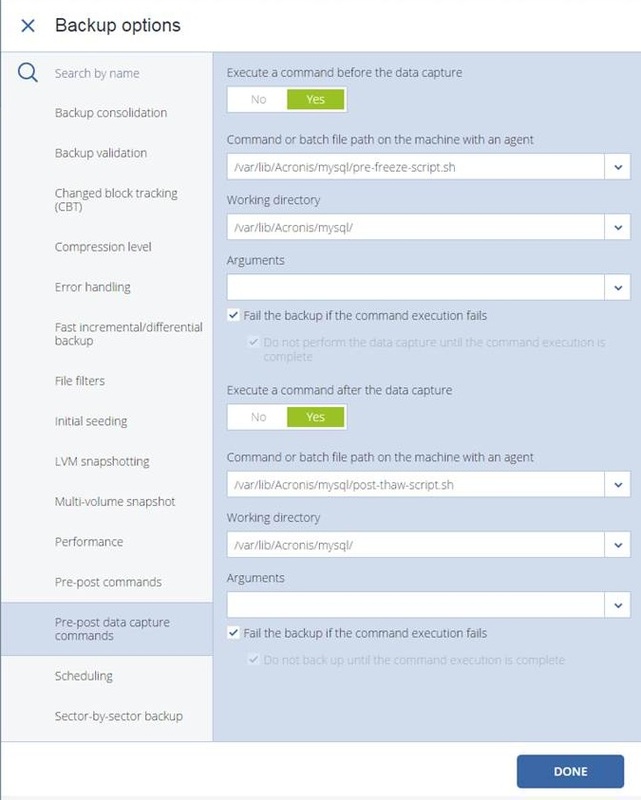 There is no need to add these scripts into backup options when configuring a backup task in the backup console.